Locally Sourced, Custom Created Meal Delivery. In-Home Dinner Parties and Catering Events. 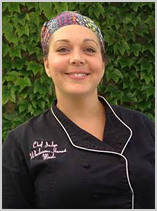 Jaclyn Trimble, Personal Chef/Caterer, and owner of Wholesome Harvest Meals graduated from Milwaukee Area Technical College with Culinary Arts degree in 2007. After gaining experience through working with some of Milwaukee’s most amazing chefs, she decided to move back home to the Twin Lakes area and start her own business. Chef Trimble has always had a passion for using seasonal ingredients from her local farmers, so moving closer to the source seemed like the right move. 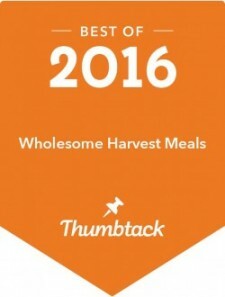 Wholesome Harvest Meals was started in 2011 with incredible support from her family, friends, and the surrounding community. In April of 2015, Chef Jaclyn Trimble expanded her catering business by moving into her own certified kitchen in Rochester, WI where she creates exclusive made to order custom meals and offers an on-site Private Dining Party Experience. All of the custom created entrees, desserts and appetizers that Wholesome Harvest Meals offers are freshly prepared with locally sourced, farm fresh ingredients delivered right to our door. In addition to our Custom created meal delivery services, we also offer private dinner parties and catered events… at our place or yours! We Offer Several Different Services to Fit Your Needs! First, I will meet with you for a no cost consultation to discuss you and your families likes/dislikes as well as any nutritional requirements. After that, your work is done. Leave the rest up to me! Then you will have Wholesome, home-cooked meals at your fingertips!